The patent pending Lumark Crosstour� LED Wall Pack Series of luminaries provides an architectural style with super bright, energy efficient LEDs. The low-profile, rugged die-cast aluminum construction, universal back box, stainless steel hardware along with a sealed and gasketed optical compartment make the Crosstour impervious to contaminants. 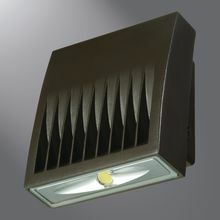 The Crosstour wall luminaire is ideal for wall/surface, inverted mount for fa�ade/canopy illumination, post/bollard and low level pathway illumination including stairs. Typical applications include building entrances, multi-use facilities, apartment buildings, institutions, schools, stairways and loading docks.